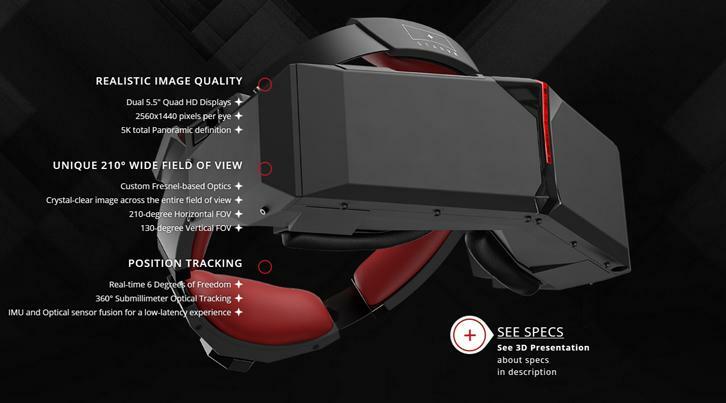 Rate this Article Experience virtual reality with a much wider field of view with StarVR! The rise in popularity of Virtual Reality headsets or HMD’s (head mounted devices) has given way to a barrage of VR products with developers coming up with the latest and most advanced hardware and applications for the technology. Most of the HMDs currently on the market today use lenses that provide the user a Field of View (FOV) of 100 to 110-degrees or a little more. This is awesome not to say in the least but it kind of limits the natural span of vision of your eyes. This is really no reason to complain about the current VR technology as we should actually be thankful that they are available commercially. However, the advancement in technology should and definitely will not stop there. The Star VR headset was introduced by developer Starbreeze Studios at the E3 2015 convention. It came along with a demo for Overkill’s The Walking Dead game. Star VR is not yet available commercially and basically still under development but the technology it displayed, surpassed the current VR headgears available today. Wave after wave of Zombies pour in to devour you. From the front, left, right, above you and even coming from behind you. You can catch the movement from the edges of your eyes because your vision seems to be curved around you. You swivel the toy gun like mad shouting in terror as you bring those monsters down who keep coming in all directions. Unfortunately, your ammo doesn’t last forever and…you die. They remove the headset as you look about you disoriented, wild eyed and still trembling in terror. The demo had done its job and you walk away with a VR experience that will be very hard to forget. To begin with, the headset is lighter than expected. With all the sensors, markers and especially built Quad HD and Fresnel based optics, Starbreeze has kept weight to the minimum. Also the strap is adjusted via a dial located at the back which securely fastens the unit to your head, and in case you find the need to get back to reality as quickly as possible, the front visor can be swiveled up at any time. The unit makes use of a pair of 5.5” Quad HD LCD screens which displays a resolution of 2560 x 1440 pixels per eye in combination with custom made Fresnel lenses that give of the curved quality for a whopping 210-degree horizontal and 130-degree vertical Field of View. This eliminates the need to keep on turning one’s head as you can see more of the environment around you. The lenses are mounted a lot closer to your face (almost touching your eyes) which eliminates the goggle like effect found on most current VR headsets. This results in an immersive perception that you are actually there inside the game. The tracking system is superb. The headset alone is riddled with a bunch of fiduciary markers as well as the shotgun that has a couple of marker cubes attached to it. According to Strabreeze, any peripheral can have markers attached to them so that they can be used in-game. The fiduciary marker system uses objects that are placed in the FOV of an imaging system and appear in the image produced. Digital points of references are manually applied to objects in a scene (VR Shotgun with marker cubes) so that it can be recognized in images of the scene. The markers are tracked so waving it like a stick will have the same effect in-game. Tracking is done by a high grade camera that works decently well, however, there are several issues regarding lighting and contrast that still have to be dealt with. The Star VR headset is still under development and is still a long way to a finished commercial product. Feedbacks on issues regarding visual clarity and distortion have been observed. The device currently uses a frame rate of 60 frames per second and the scene has been observed to blur when the user turns his head. According to the developers, the use of any high-end graphics card (GPU) will suffice for the moment while development for both hardware and software continues to move on. The NVIDIA GeForce GTX TITAN X was already used as the GPU in the demo and is said to be by far the most advanced GPU in the market, yet it had trouble rendering the game when used for the VR. Current deficiencies aside, the Star VR is currently ahead in terms of VR technology as StarBreeze continues to make it into a very promising high-end commercially available VR product. There is still no release date at the moment nor is any pricing available. The company has already enlisted the assistance of several game and software developers to develop specific content for it. As for The Walking Dead, Overkill will be making it available for the PC, PlayStation4 and the Xbox One. For those who have experienced the VR demo and those who will, let’s remember that the technology is in continual progress and everything that could possibly happen in terms of VR is just a matter of time.